Wyoming Center for Political Economy: Do We Have $958m More to Spend? Do We Have $958m More to Spend? The debate over state tax revenue continues. Yesterday I revisited the "funding gap" chart that the Economic Analysis Division has put out. It was in part in response to a reader's request, in part because I have several reasons to question the quality of work being done at the EAD. For example, their news release last week - like news releases before it - was sloppy and easily misled readers into believing that the trend in sales-and-use tax revenue was different, and better, than it really is. Barring any sharp changes by January, lawmakers will convene in Cheyenne next year with a fresh $958 million on state balance sheets, according to the fine print of the annual October state revenue report. The bottom line for lawmakers: Education funding continues to run at a deficit but projected revenues match projected expenditures on the general government side. First of all, it is not the case that our lawmakers have $958 million more to spend right now. That is not the case: as WyoFile explain later on in their article, the number is a combination of increased rainy-day funds and a predicted - not materialized - influx of new revenue in 2019 and 2020. This is a fundamentally important piece of information, yet it is now being treated as though our state lawmakers actually have almost $1 billion extra to spend. They don't. The entire number is in fact dependent entirely on CREG's notoriously dicey forecasts. Even when the rainy-day fund has grown, its use is contingent entirely on the CREG revenue forecasts. The use of the fund, namely, is as a buffer in case CREG's forecasts turn out to have been overly optimistic. In other words, it is not money that the state can commit to any spending increases. Not now, not in the future. All that the fund can be good for is to replace lost revenue. For that purpose, though, the money can turn out to in high demand. 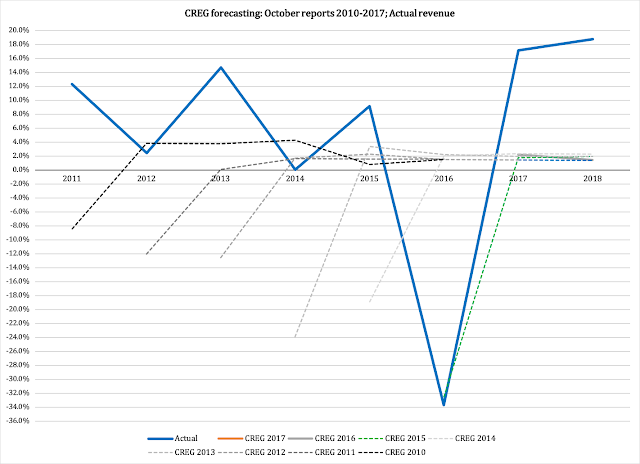 As I explained last week, CREG is notoriously unable to predict revenue within reasonably acceptable margins of error. Add to that their built-in bias in their forecasting model, a bias that produces excessively positive forecasts, and the extra cash in the rainy-day fund could very well be gobbled up by current spending within the next couple of years. But what about the other half of that $958 million? Is that not available for spending? In one short year, CREG has revised its outlook by 12-20 percent (the 2018 revision is against facts, obviously a different matter). While it is perfectly reasonable to modify forecasts over the short term, revisions of this magnitude, over a period of time that spans several years, frankly renders the forecast useless. To be fair to CREG, I am using their own record of historic revenue (the solid blue function) to compare with their own historic forecasts (dashed lines). I should mention that I do not envy the CREG economists. They do not have an easy job (although they do have it because they chose to). Economic forecasting is a minefield for anyone who dares enter it. The use of econometrics does not help: econometricians must rely on long-term stability in order to get useful results out of their forecasts. For this reason, econometricians practically always fail to see a sharp turn in economic activity when it is coming. When their forecasts are used by legislators who choose to make multi-year spending commitments on schools, health care, welfare and other programs, those forecasting failures turn into major problems. The reason is, plainly, the combination of big spending and forecasts designed to support that spending commitment - not present an impartial outlook on the economy. It is better to be approximately right than exactly wrong. 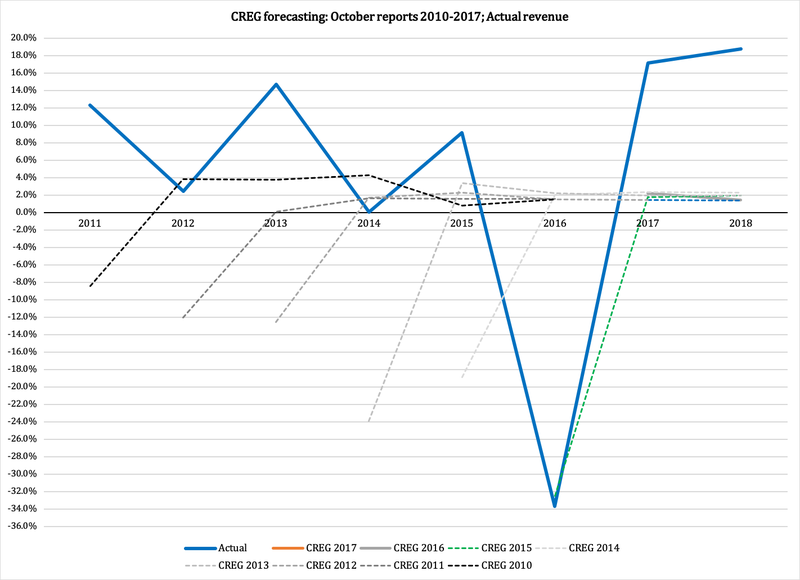 When CREG now predicts another $463 million in predicted revenue, as far out as 2020, our legislators should consider the consequences if that forecast turns out to be exactly wrong. What will they do with their budget, especially if they choose to increase spending, as WyoFile tries to suggest? Just as one example, the two-year outlook on oil prices shifted by 48 percent from 2014 to 2016, then by 33 percent again from 2016 to 2018. The 2016 prediction of 2018 General Fund revenue turned out to be 34 percent wrong. That turned out to be an under-estimate, but the same two-year outlook back in 2014 over-estimated revenue by 14.4 percent. Suppose, just for a moment, that today's revenue prediction for 2020 is 14 percent too optimistic. That means $172 million less to spend than what CREG has now told the legislature they will have. At a 20-percent forecasting overshoot, the loss is bigger than $246 million; at a 34-percent error (as big as the error was in 2016, just the opposite direction) the legislature will end up with $418.4 million less than what WyoFile and CREG now say they will have. And this is for one year. Keep in mind that the $463-million in predicted extra money is for the 2019-2020 biennium. It takes a forecasting error of less than 19 percent for the entire biennium to wipe out all that money. Which ones of our lawmakers are willing to take that risk?